Read Rea & Associates’ 2018 Annual Report to learn more about the Top 100 Accounting and Business Consulting firm. The word “disruption” has risen to the top of our buzzword vernacular. Businesses, including ours, are facing massive changes stemming from advancements in technology, the retirement of an entire generation, the advancement of an entirely new generation and a job market that favors the job seeker, which increases competition among companies to seek out and secure top talent. As a result, we’re seeing distinct differences between businesses poised to persevere amidst these changes and those that run the risk of becoming obsolete. As a CPA and business consulting firm fueled by a leadership team committed to long-term sustainable growth, we’ve chosen to embrace the disruption in our industry as a means for innovation in the way we do business, recruit top talent and nurture our relationships with the young leaders in our firm. Our journey of disruption will be ongoing and we will continue to seek out ways to be more efficient in the way we do business. Not because we are afraid of becoming obsolete, but because disruption is built into the very fabric of our firm. 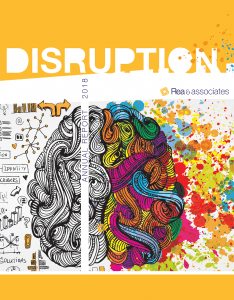 Check out “Disruption: Rea & Associates’ 2018 Annual Report,” to learn how we’ve addressed changes in our industry over the last year and how we plan to rise to the challenges ahead of us. Rea & Associates’ annual report highlights events that occurred over the course of the firm’s fiscal year, which begins November 1, and ends October 31. Copyright 2019 by Rea & Associates: all rights reserved. No part of the contents of Disruption: Rea & Associates’ 2018 Annual Report may be reproduced by any means or in any form, or incorporated into any information retrieval system without the consent of Rea & Associates. Permission requests may be sent to the editor at rea.news@reacpa.com.